The Zoroastrian initiation ceremony, called the Navjote by Parsi Zoroastrians or Sudreh-Pushi by Iranian Zoroastrians, is an investiture of a sacred shirt (sudreh) and sacred cord (kushti) that will be worn throughout life as reminder of how to live a good life. While the ceremony is performed in distinct ways by the Iranis and Parsis due to centuries of the geographic separation of the two communities, the underlying premise and function are the same. The initiation represents an affirmative choice to enter into the faith and to live as a Zoroastrian. The initiation is performed when a child is old enough to choose the religion for himself/herself. Parsi Zoroastrians traditionally perform this ceremony between the ages of seven and eleven and Iranian Zoroastrians perform the ceremony between the ages of twelve and fifteen. Before the Navjote/Sudreh-Pushi, the child takes a ritual bath called a nahn that is accompanied by prayers intoned by the officiating mobed, or priest. The purpose of the nahn is for the child to be cleansed physically (with the bath) and spiritually (with the prayers) in preparation for the Navjote/Sudreh-Pushi ceremony. The ceremony includes the recitation of prayers in Avestan by both the initiate and the mobed and the investiture of the sudreh and kushti. The child’s hands are placed in the sleeves of the sudreh during the recital of the Yatha Ahu Vairyo prayer. This is followed by the recitation of the Din No Kalmo, which is the declaration of faith in the Zarathushti religion. This prayer is recited three times before the child is helped by the priest to put on his/her sudreh for the first time. The priest then recites the dedicatory portion of the Hurmuzd Yasht, a prayer in praise and salutation of the Lord of Wisdom, Ahura Mazda, before starting the kushti ritual. Next, the child performs the kushti ritual, along with the priest, while reciting the Hormazd Khodae prayer, which begins by denouncing all bad thoughts, words, and actions. The act of shaking the kushti during prayer is a symbolic gesture to keep away all evil. The kushti is tied three times around the waist, a constant reminder to follow the basic tenets of the Zarathushti faith: humata, hukhta, and huvarashta (good thoughts, good words, and good deeds). The kushti is then tied in the front of the waist with two knots during the recitation of two Yatha Ahu Vairyo prayers, particularly when the word shyaothenanam (good actions) is recited. This reinforces the belief that the tying of the kushti is a good action performed for Ahura Mazda. The kushti is then tied at the back while reciting the Ashem Vohu prayer. Come to my help O Ahura Mazda. I am a Mazdayasni, a Mazdayasni according to Zarathushtra. Thus firmly do I declare my faith. I acknowledge my faith in Good thoughts, well conceived. I acknowledge my faith in Good words, well spoken. I acknowledge my faith in Good deeds, well done. I acknowledge my acceptance of the good religion of Mazda, that which ends strife and disarms violence, that which makes us righteous and self-reliant. It is the religion of those that have been and that shall be, the noblest, the best, and sublimest—the religion of Ahura Mazda brought to us by Zarathushtra. All good derives from Ahura Mazda. Such is the declaration of the Mazdayasni Religion. This ceremony concludes with the priest blessing the new initiate with a shower of rice and rose petals and the recitation of the Tandarosti prayer for good health and well-being. 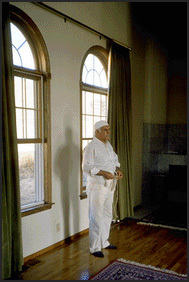 The sudreh, an undershirt made of white muslin cloth, is to be worn each day as a reminder of one’s responsibilities as a member of the faith. It has a small pocket, called a girehban or kissekerfeh (a “pocket of merit”) that symbolizes the importance of good actions. Each night, the wearer remembers the contents of the pocket: the good thoughts, good words, and good deeds accumulated throughout the day. The kushti tied around the waist is made from seventy-two threads of lamb’s wool to symbolize the seventy-two chapters of the Yasna liturgy. Zoroastrians who wear the sudreh and kushti tie and re-tie the cord while reciting prayers at specified times throughout the day, such as each morning upon waking, after showering, and before eating meals. American Zoroastrians who live far from a major city often face difficulties in arranging for this important ceremony due to the lack of a trained mobed in their community. Many American Parsis travel to India or Pakistan to celebrate the event. The preparation for the initiation has been made easier in recent years with extensive educational material that teaches both the prayers and their translations. The Navjote/Sudreh-Pushi reveals many key elements of the Zoroastrian faith. Unlike many other traditions, the rites of initiation for girls and boys in Zoroastrianism are precisely the same and the core belief in gender equality is reinforced by this practice. Further, the initiation is intended to be a choice, underscoring the importance of intelligent reflection and the centrality of human choice and ethical responsibility in Zoroastrian religious life. However, it also raises the highly contested issues of conversion and intermarriage and the question of who may be considered a Zoroastrian. Responses range widely, from those who believe that the only requirement to be a Zoroastrian should be a thorough knowledge of, and dedication to, the faith, to those who believe that only those children born to two Zoroastrian parents should be initiated. Much debate was raised after Joseph Peterson, a Euro-American of Christian parentage, had his Navjote/Sudreh-Pushi performed on March 5, 1983. Peterson came to the Zoroastrian faith through extensive study and a firm belief in the tenets of the religion; his initiation was performed by four priests, two Parsi and two Irani, in New Rochelle, New York. Since that time, a number of Americans born to non-Zoroastrian parents have come to the faith through the Zarathushtrian Assembly of Los Angeles. Within the small religious community of Zoroastrians, the debate surrounding conversation continues.